Happy New Year! I hope everyone had a lovely festive season, I know for some it’s still not over yet but with a little disappointment I took down my decorations earlier today. On the other hand, I’m ready to start a brand new year and have been creating an ‘inspiration board’ to refer back to when I’m feeling a little lost. An inspiration board can be a great way to almost ‘meditate’ over your goals. Get yourself some mountboard (available in hobby/art shops like Hobbycraft), a stack of old magazines and any crafty extras you want to make your board beautiful (glitter glue etc) and pull out any images or text that relates to your goals. Collaging can be very relaxing and I find it very therapeutic allowing myself to just be creative with no worries of how the final product will look. You can make words by cutting out different letters, make areas stand out using 3D tape/craft dots and really experiment creatively. Put it up somewhere where you can look at it throughout the year, to refresh your enthusiasm. In my last post of the year ‘How to have a greener Christmas‘ I told you to hang on to any wrapping paper you couldn’t recycle and gave some ideas on how to put it to good use. Next week I’ll be demonstrating some of these ideas in a step-by-step tutorial. Although for many this time of year is one of the most exciting, it’s also one of the most wasteful. It’s lovely to see the beautifully wrapped gifts under the tree, and the sparkling decorations hung everywhere, but so much of it eventually ends up in the bin. Unfortunately not all wrapping paper can be recycled (you can read more about this on recyclenow.com, which also has a handy search tool to find your nearest local recycling centre!) and plastic can take hundreds of years to biodegrade. Recycle what you can, but if you fancy getting a bit creative, today I’m going to give you some ideas on how to give your wrapping paper and broken decorations a second life. Beaded Christmas jumpers, beaded tree decorations…we’ve all had that moment where somehow they catch on something and suddenly beads are scattering in all directions! Instead of chucking them in the bin, save them and make yourself a brand new decoration! These make wonderful gifts, especially as each is guaranteed to be unique! It’s worth saving little metal charms etc that sometimes come on posh packaging as these can be used too! It’s good to work out a ‘pattern’ for your beads, for example ‘big bead, small bead, medium bead, big bead, small bead, medium bead… etc. Bend your wire a little so the beads don’t fall off the end. Keep going until you reach the desired size and can make a small circle. Slide the right-hand bit of wire through a few of the beads on the left and pull lightly so you have a complete circle. Now you need to secure things. Tightly twist the bit of wire on the left around the straight wire that the beads are threaded on a few times, then snip off the excess wire. Slide the beads over to disguise it. Do the same with the other side until you have a complete circle. Now’s the time to add your charm. If you can see a bit of wire, this is your chance to disguise it. Fold your ribbon in half and slip it through the loop on your charm. Put your ribbon through the circle, with the folded half facing you and slip the untied side through the loop of ribbon, like below. You need to secure your charm into place, so gently pull the ends of ribbon through the loop until it’s quite tight and the charm is hanging down. Now you can tie the ends of your ribbon so you can hang your decoration. This ‘pattern’ is really versatile and can be adapted to use up what you have. You can use broken earrings, broken necklaces, and you don’t even have to limit it to just Christmas! You can use any colour beads you have to create summery, girly, gothic, any style of decoration to suit your taste and hang them in your car and around your home. ♦ If your new year’s resolution is to learn a new craft why now try origami? The colourful papers make beautiful decorations! And finally, as someone who loves making unique clothes out of upcycled/recycled materials, next month I’ll be showing you how to make your very own paper beads! They’re fun to make and you can get really creative incorporating other materials. Merry Christmas everyone and as we say in Wales: Nadolig Llawen! Here in sunny Wales it’s been raining for over a week! Although soggy strolls with my dog and taking refuge in coffee shops have been welcome excursions out of the house I’ve been enjoying finishing off my Christmas card design. I’m happy with the finished product and am eagerly awaiting the arrival of my order from the printers. Final card design, water mixable oils. As my old neighbour (‘old’ as in from my previous home) has been so kind to me this year I decided I would also get a mug printed using my design and give it to her as a Christmas gift. Christmas is such a wonderful excuse to get creative, from card making to baking and making your own gifts. Next week I’ll be showing you how to use your leftover wrapping paper and turn it into something beautiful! If you’re working towards a brief (if you’re studying art/design at GCSE onwards this word will become familiar to you and you’ll hear it often) then you have a good starting point. Read it carefully and make bullet-points or highlight exactly what it is you need to fulfil. Are you designing a Christmas card? A design for packaging? Does the brief state what style/feel they want? The more information you have the easier it is to generate ideas. Starting a self-led project from scratch can be difficult because every decision you make has to be your own and a successful design isn’t usually created by just picking up your paintbrush straight away without any blueprints. If you don’t have a brief, set yourself one. Write down briefly what you want to create, who/what it’s for and what sort of style you want. For example, I’m creating a Christmas card design, it’s for my family and friends, and I’d like it to convey warmth and cosiness and be in a cute illustration style. Now you’ve got your basics you need to build on this. Your task is to convey your meaning successfully. It can help to make some notes (I like to do colourful spider diagrams) to get any ideas in your head down. Let’s use my brief as an example. It’s for Christmas so I’d write down all the things I associate with Christmas, for example: holly, mistletoe,family get togethers, gifts, snow, stars etc. Do the same for the other important messages behind your intended design, in this case ‘warmth and cosiness’, which made me think of things like: blankets, thick coats/jumpers, fireplace, hot drinks etc. You’ll have quite a bit to work with by the end of this idea outpouring, so you need to narrow it down and decide which elements you think will work well together or excite you most. Once you’ve decided what you’d like to include it’s time to pull the pieces together. How are you going to put these elements together in a way that’s natural and pleasing to the eye? It can help to do a bit of research at this point, see what other artists have done, and how they’ve gone about positioning things. If you’re designing a greeting card it can be really useful to browse card selections in shops. Bear in mind the message you want to communicate and work around this. For me, I wanted my design to be ‘soft’, which means soft, rounded shapes that curve and flow, rather than sharp edges. This is why I chose to position my chosen features (poinsettias, mistletoe etc) in a circular wreath and made my character rounded. Collecting images and making a small inspiration board to refer back to can be really helpful. When designing my Christmas card I collected a few photos of poinsettias and hedgehogs and worked from these, remembering my desire for ‘softness’. I like to do rough sketches of each element I plan on using before bringing them all together. I knew I wanted to include a hot drink in my design so I sketched a couple of versions of this until I found a version I was happy with. I like to make notes next to my sketches, for example, I wanted my hedgehog to be more rounded, so I wrote a note to remind myself ’rounder’. It’s ok for your rough work to be messy, no one will see this stage, this is your chance to get all your ideas down and play around to see what works. When you’re happy with your sketches and have decided the layout of your design it’s time to think about colour. Some colours work harmoniously and this is what will be most pleasing to the eye. Have a think about what sort of message you’re intending to send with this design, do you want it to feel cold and wintery for example? (in which case you’d consider cool colours) or warm an cosy? (in which case you’d consider warmer colours). For my design I wanted warmth but also to continue the feeling of ‘softness’. For this reason I chose not only warmer colours but quite muted versions of these colours. By this I mean I didn’t choose just orange, I chose a more burnt orange. A lot of the colours I chose I had to mix with colours such as burnt umber, burnt sienna and ochre to get that muted tone. I’m a huge fan of building yourself a collection of paint sample cards for use in your art/design planning. Get a file and get in to the habit of picking up some sample cards/booklets any time you find yourself in or passing a DIY/home shop. You can also just pay a visit to one when you have your colours already in mind. If you know you want cool colours, go and pick up sample cards just of these. You can do this for each project. I then hold colours I think I want to use next to each other and decide which appear most harmonious. When you’ve chosen, stick them to your rough sketches so you have a guide of what goes where. As you can see below, I’ve assigned colours to various parts of my character. Before starting your final design it’s useful to work out sizing and most of the time I like to have a complete rough version with everything in place. Once you know where everything is going and how large it needs to be, it’s time to select your paper and begin. You can read about selecting the right paper in my guide: ‘Choosing the right sketchbook‘. I chose to use fine grain heavyweight paper as I wanted a hint of texture as well as a paper that could hold oils well. Once you’ve transferred your design, you can begin adding colour. What medium you use is up to you but it’s essential to use paper that can handle your medium (see my mentioned guide, above, to read more about this). As you can see on my rough pages, I’ve mixed my colours and tested them next to the samples before applying them to my piece. It’s a good idea to have some scrap paper nearby to test your colours on, particularly as they can appear different on your palette than on your paper. Some colours can dry lighter, some darker. I’ll be revealing my own complete design next month and kicking off December with some unique, creative gift ideas for you! As my blog followers will know, I love to find enthusiastic artists out there and give them a bit of exposure here. There are so many talented individuals out there whose work just needs to be seen and shared! As I’ve been working on my large Mabinogion piece (if you missed the post about this you can find it here: link) I decided to have a dig on Deviantart (you can follow my account here: hmwillustration) for some Celt-inspired work and came across some superb pieces. It was difficult to narrow down my favourites but after much deliberation I’m sharing my top 3. Be sure to check out each artist’s profile, or better still let them know what you think of their wonderful work! Please remember that the copyright belongs to the artist. Roberto has been a member of DeviantArt for many years and his gallery is full of interesting photography and tattoo designs. He has a whole gallery folder dedicated specifically to Celtic tattoo design, with my favourites being his Celtic dragons. Also look out for the exquisite ‘Swallow’ and ‘Ravens’. Rachel is from Italy and has a love of Gouache paint. Her gallery is entirely dedicated to Celtic designs and is a treasure trove of intricate work. Below is one of my favourite pieces, titled ‘Twelve Days of Christmas’. Lucie is from the Czech Republic and works a lot with watercolours. Her gallery has a collection dedicated to her ‘Knotworks and Patterns’ which are made truly unique with her interesting application of watercolour and small additional details. Below is ‘Celtic Butterfly’, just one of many beautiful pieces of subtle knotwork. Next week i’ll be posting my usual ‘Monthly Tutorial’. This time I’ll be showing you how to develop your ideas. This is one of my most treasured Froud books in my collection, possibly because it really stands out from the others. What makes this book so unique is the interaction the reader has with it. Each page is filled with Froud’s distinctive fairy illustrations, but also draws the reader/viewer in by having all sorts of interesting attachments. From ‘handwritten’ pull-out letters, to envelopes containing quaint surprises, this book encourages exploration by the reader, involving another sense (touch) rather than the usual individual sense of sight (though I must admit I’m a fan of the smell of new or very old books…I know I’m not alone in this!). As with many of Froud’s book the creativity and attempt at authenticity doesn’t stop with the artwork. The text itself could be argued to be a work of art in itself. Throughout we’re treated to a range of interesting fonts, from beautiful italic handwriting to calligraphy-style work. One thing that Froud never fails to do is draw his audience in. It’s almost as if he believes these wonderful scenarios and worlds he imagines. I love the dedication to making the book and backstory seem as authentic as possible, it shows Froud’s utter enthusiasm for his work. Much like his other books the target age for this book is debatable. Whilst fairies and similar subjects are often thought of as geared more towards children, Froud’s work always seems to fall into this ageless space. I can imagine children and adults alike enjoying this hands-on book. That being said, for the very reason that it is hands-on this book isn’t suitable for very young children as delicate pull-outs may be easily torn/damaged. Some understanding and prior-knowledge is also needed to understand the basis of this book. Many adults will be familiar with the true story of the girls who, in 1917, took ‘real’ photographs of fairies in Cottingley, England (which were later exposed as being fake). The book is intended to be a ‘scrapbook’ of the girl in the famous photograph, named Angelica Cottington. As mentioned in last month’s review of Froud’s ‘A Field Guide to Goblins; The Goblin Companion’, whist wonderfully elaborate the story can be difficult to follow, particularly for younger readers. For this reason I’d recommend this book for older teenagers on wards, however I’m sure children would love to be shown the quirky illustrations and would delight in the pull-outs being demonstrated (do take note that some fairy poses are quite cheeky though! Parents may want to flip through and judge for themselves first). Price-wise this book is affordable and I personally feel that the joy I get from revisiting this book again and again is worth every penny paid. I’d recommend this book to anyone with an interest in illustration, other worlds, and those young at heart. 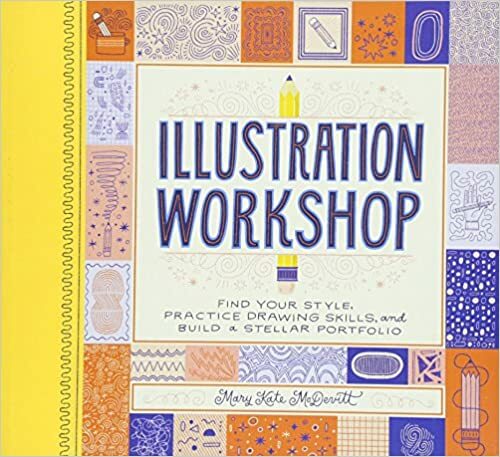 This month I’ll be reviewing a book I got in the summer; ‘Illustration Workshop’ by Mary Kate McDeritt. Full title: Illustration Workshop: Find your style, practice drawing skills, and build a stellar portfolio. About: Written/compiled by American illustrator Mary Kate McDevitt, this appealing book guides you into the world of illustration. From the very first page you’re encouraged to get creative (literally – your first activity is to write your name and draw yourself) offering practical information on the industry, materials illustrators use, small warm-up activities and whole guided projects. The layout – it’s fair to say this book is very aesthetically pleasing; with bright colours, illustrations throughout and interesting typography. The book itself is a piece of illustration work! It also breaks things down into sections making it easy to follow. The writing style – The language and tone of the book appeals to ‘everyday’ people which makes it accessible to even beginners in the field of illustration. Everything is explained well without any hint of pretentiousness. The activities range from small to large projects meaning if you have just 5 minutes to fill there’s something for you, if you have 5 hours to fill, there’s also something for you. Projects are guided and go through a process. You follow each section of the project so you’re never left wondering where to go next. If your imagination seems to be having a day off, there are activities within each project to get your creative juices flowing, such as questions (‘who is your target audience?’) and a section for a spider diagram. In addition to the mini activities within each project there’s also some visual inspiration, which is great for those of us who think more visually. In my opinion I love this book! It was affordable, pleasing to look at (I’m a very visual person) and gave my need to practice my illustration skills/develop my style a direction. It can be hard to pull a project idea out of the air, which is why this book is so useful. I like the honesty with which McDermitt writes and the personal edge she gives it. The projects are engaging and the small warm-ups very unique! I’d recommend this book to anyone looking to develop their illustration skills, especially if they feel they need more direction.